After the Olympic games in Berlin in 1936 introduced gliding as an Olympic sport, plans were made to fly the 1940 Olympic championships with a standard design of sailplane to give each pilot the same chances. The FAI (Federation Aeronautique Internationale) duly announced a design competition for what was to be the Olympic sailplane. This specified a span of 15m (49ft 2.5 in), an empty weight of 160kg (353lb), a payload of 95kg (209lb) and a maximum speed of 200km/hour (124mph); only one material was to be used for construction throughout, air brakes were to be fitted but flaps or a retractable undercarriage were not allowed. The competition was held at Sezze airfield in Italy between 20–26 February 1939 and was duly won by the Meise which had first flown earlier that year and which, like the other competing aircraft, was evaluated by six well known pilots from several other European countries. The Meise had been redesigned to fit into the new Olympic class specifications. 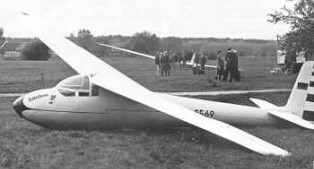 The new 'Olympia' Meise had the prescribed wingspan of 15 m (49 ft 2 in), spoilers, but no flaps, and an undercarriage consisting of a skid and a non-retractable wheel. The pilot sat all-enclosed in an aerodynamically clean fuselage made of laminated wood and topped by an acrylic glass hood. The plane could be launched by winch as well by airplane. Its wood-and-fabric construction made it easy for flying clubs to maintain, to repair and even to build the gliders from kits.Approach control is by top and bottom Surface Schemmpp-Hirth type airbrakes. The original version used a takeoff dolly. The Meise was in many respects a classic design with excellent flying qualities; its high cantilever wing was of wood and fabric construction and had DFS air brakes, while the fabric-covered wooden fuselage had a landing skid under the forward part, and the pilot sat under a detachable framed cockpit canopy in line with the wing leading edge. When the Meise first flew it soon aroused interest in many countries in the few months before war broke out, and the German Aero Club supplied design details to a number of prospective customers. Both the Meise as well as the Olympic class gained immediate enthusiastic support, and the 1940 Olympic gliding championship would probably have ended up as an all-Meise contest — if the Second World War had not intervened and the 1940 Olympics had not been cancelled. 626 Olympia Meises were built in Germany during the war by Flugzeugbau Ferdinand Schmetz Herzogenrath (601 built) and Flugzeugbau Schleicher (25). Most of the German production were among the 15,000 German gliders destroyed in 1945. 17 were also built at the time in Sweden. The Meise, also sometimes known by the designation 108-70, set a pattern that lasted well into the postwar years, for it was built in France after the war as the Nord 2000. By November 1947, 100 Nord 2000 were ordered into production. In Britain the design of the Olympia Meise was taken up by Chilton Aircraft Ltd., Elliotts of Newbury produced (as the EoN Type 5) the original skid version, and a modified version (Olypia 2B) with non-retractable main wheel. The German drawings were not detailed and so entirely new drawings were made that retained the Olympia Meise's aerodynamic shape but otherwise it was a stronger and heavier aircraft. After building one prototype, which flew in 1946, the rights and drawings of the Chilton aircraft were taken up by Elliotts of Newbury (EoN) in the UK. Their first EoN Olympia flew in 1947. Later variations were produced by Elliotts into the late 1950s. The Olympia was also built after the war in Germany, in the Netherlands, in Spain, Switzerland (12), Hungary (35) with a further twenty modified as the Cinke, Australia (3), Austria and in Czechoslovakia as the Zlin Z-25 Šohaj, and Brazil (07). The Vintage Sailplane Association has plans. Structure: wood/fabric wings and tail, wood fuselage. Over 952 were built in total. The Meise was built in Frace as the Nord 2000. By November 1947, 100 Nord 2000 were ordered into production. In Britainthe design of the Olympia Meise was taken up by Chilton Aircraft Ltd., Elliotts of Newbury produced (as the EoN Type 5) the original skid version, and a modified version (Olypia 2B) with non-retractable main wheel. The Olympia was also built after the war in Germany, in the Netherlands, Switzerland (12), Hungary (35) with a further twenty modified as the Cinke, Australia (3), Austria and in Czechoslovakia as the Zlin Z-25 Šohaj, and Brazil (07). 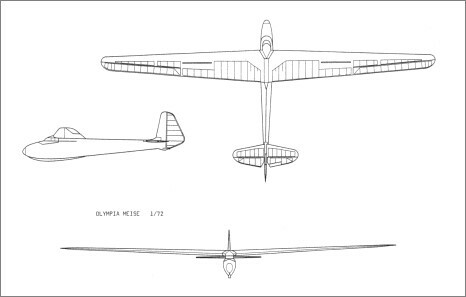 The original design for the 1940 Olympic gliding competition; built in large numbers during and after World War II, in Germany, Sweden, the Netherlands, Switzerland, Hungary, Austria and Brazil. A single prototype built in England, by Chilton Aircraft, in 1946. Further production in the UK after Elliotts acquired the rights to the design from Chilton. EoN Type 5 Olympia 1: Improved Olympia-Meise. Landing skid. EoN Type 5 Olympia 2: Fixed monowheel. EoN Type 5 Olympia 3: Jestisonable dolly wheels and skid. EoN Type 5 Olympia 4: New wing section, NACA 643618 at root, NACA 643421 at tip. A modified version built in Hungary post-war.